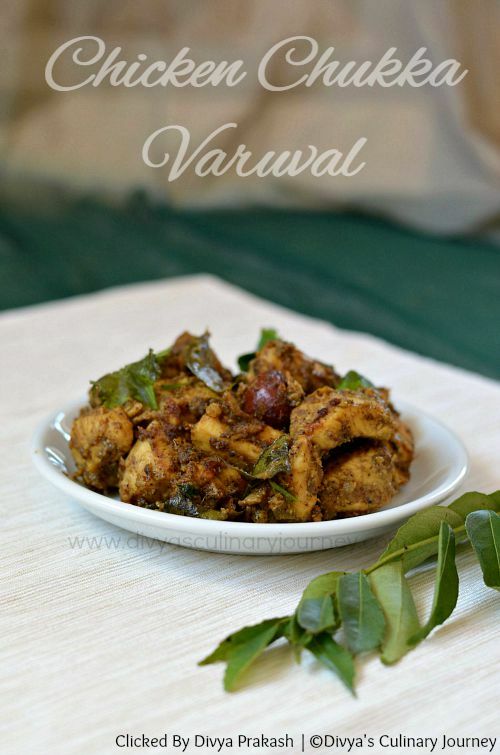 I am sharing Chicken Sukka Varuval Recipe today. It is one of the famous dishes in Chettinad restaurants and whenever we go there, we will either order Chicken Chukka or Mutton Chukka. This restaurant style recipe can be easily prepared at home. After being in abroad, we don't get the luxury to visit restaurants as we would in India, had to try replicating at home. It came out very well and everyone enjoyed. 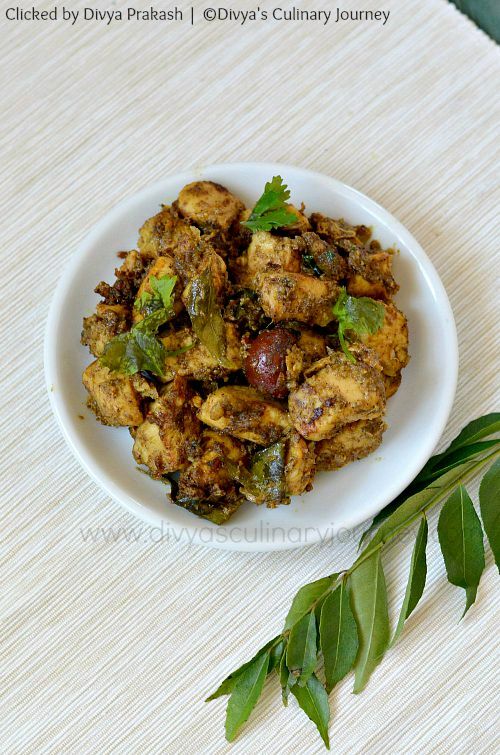 This Chicken sukka is a dry fry made with boneless chicken and freshly ground spices. How to make chicken sukka at home? First dry roast the ingredients listed for spice powder, then grind it into fine powder. Wash, clean and cut chicken into bite sized pieces. Heat oil in a heavy bottomed pan, add cumin seeds and fry till it sputters, then add finely chopped onions, red chillies, curry leaves along with ginger and garlic and fry till onions turn translucent. Then add chicken, along with turmeric powder and salt to taste, mix well. Cover and cook it in medium heat till the chicken is cooked. Do not have to add water now. Now add chilli powder, coriander powder, ground spice powder and mix well, now bring the heat to low and cook till all the liquid evaporates and fry comes to required consistency. Please makes sure to stir the chicken, scrapping the pan in between to get it cooked evenly and to avoid getting burned at the bottom. Then transfer it to serving bowl, garnish it with cilantro and serve it warm. Chicken does not require any marination. Depending on the required spice level, increase or decrease the chilli powder. Instead of red chillies, you can use green chillies too. What a delicious preparation dear, will try it this week end. this looks very delicious,love the wok presentation too.. I love the fresh ground spices! This is such a healthy, flavorful meal! Beautifully prepared! OMG the spices!!!! looks amazing! 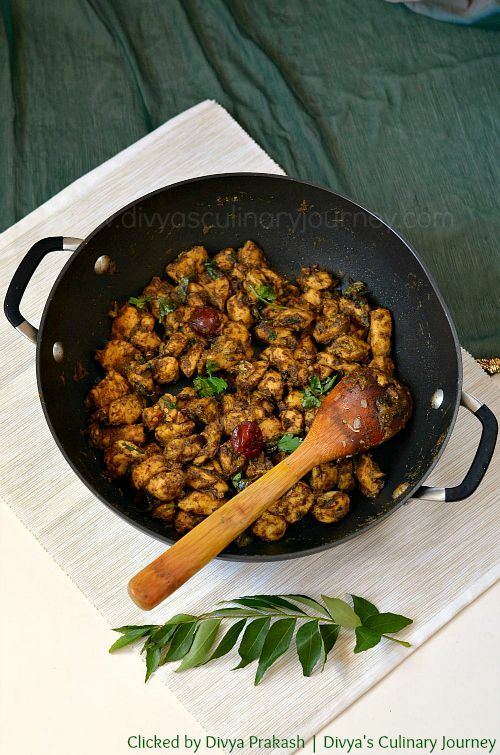 Wonderful and exotic looking chicken dish here! I would love to try this one, thanks so much for sharing! This looks wonderful! All those spices and flavors. So yummy. My husband will love this one, oh, and so will my father in law! Thanks! 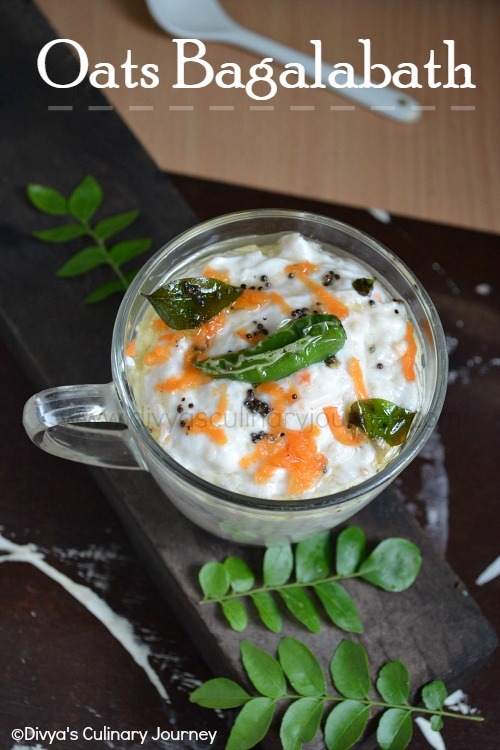 I'm very curious about the curry leaves, never seen that before. Thanks for your recipe. I like your phrase "dry fry." And I want to make this with chicken thighs, my fave!